If you’re a fan of massaman curry, you’ve come to the right place! 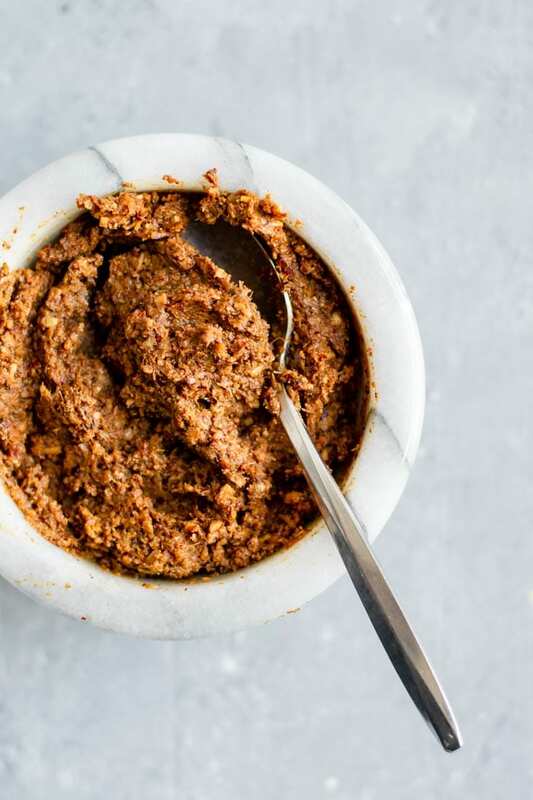 Together, we are going to make the most delicious curry, and it’s all thanks to this homemade massaman curry paste! 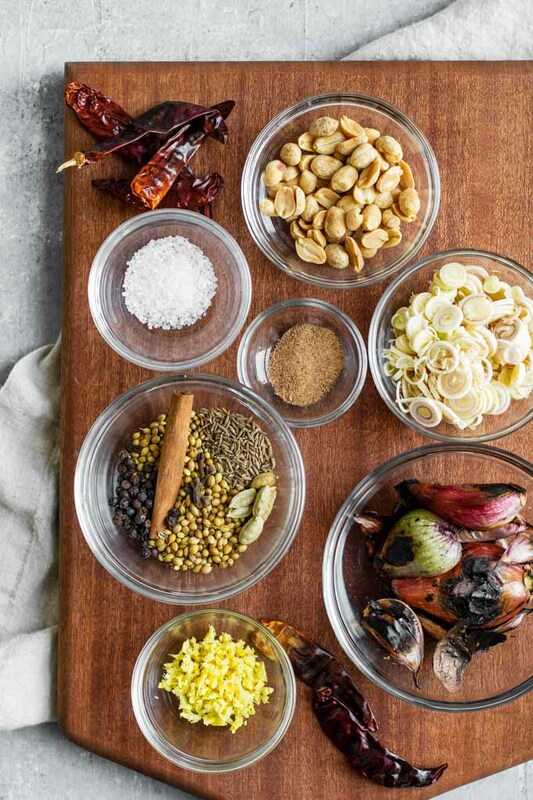 When it comes to making mouth watering Thai curries, you need to start with a flavorful base. This means making the curry paste from scratch! And I understand that sometimes store bought is a quick and easy solution. 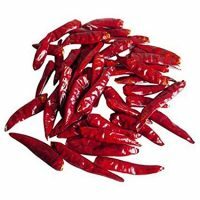 But you often sacrifice flavor, lose the ability to modify the level of spiciness to your liking, and spend more money for a smaller quantity of paste. And there’s the matter of fish sauce and/or shrimp paste lurking in a lot of those store bought pastes. 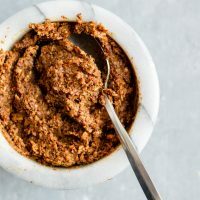 If you want to make massaman with a store bought curry paste, no judgement, you can go ahead and skip over to my vegan massaman curry to learn how to use it! Otherwise let’s delve into the ingredients and the massaman curry paste recipe! Massaman curry is a Thai curry that has influences from Indian cuisine. In fact, it is generally believed that the term massaman is derived from the archaic word for muslim. Massaman curry includes spices like cumin, cardamom, cinnamon, clove, and nutmeg which are more commonly found in Indian and Persian dishes than Thai. But it also includes Thai ingredients like lemongrass and Thai cooking techniques. It’s clear that this recipe does come from a melding of those two cuisines. Massaman curry is a slightly smokey, peanutty, mildly spicy, and really flavorful dish. It gets its smokiness from roasting the ingredients in the curry paste. Dry roast unpeeled cloves of garlic and shallots until the papery skins blacken. This little bit of burnt translates to a nice smokiness in the curry. Once they’re cool enough to touch, remove the burnt papery skins. If any part of the garlic cloves or shallots is overly blackened and burnt, also remove that. The whole spices used to make this dish also get dry roasted. In doing so we don’t want to burn the spices, just heat them to bring out their flavors and as an added benefit, this makes them a bit easier to grind. There may be a long list of ingredients to make this curry paste, but that’s how you build such a rich flavor. 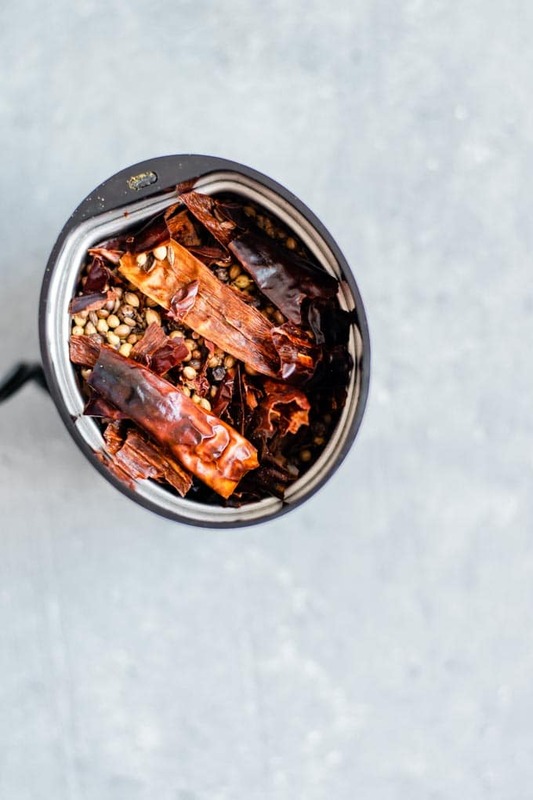 Half of the ingredients are spices, so if you have a well stocked pantry–particularly one that caters towards Indian cooking, you probably have most of them on hand. The whole spices in massaman curry paste are: cardamom pods, whole clove, cinnamon stick, coriander seed, cumin seed, whole peppercorn, and dried thai chiles (in a pinch the Indian dried chiles work as well). Once the spices are toasted, remove the cardamom seeds from the pods. Lightly smash them with the flat side of a knife and remove the outer husk, keeping only the seeds to grind. Then, remove the seeds from the dried chiles. Break them in half and loosen the inside membrane and seeds to shake them out. Peel more of the chile apart to access the membrane if necessary. Make sure to wash your hands immediately afterwards, or better yet, use food safe gloves when handling chiles. Once that’s done, the spices get ground up by a spice grinder or an old fashioned mortar and pestle. Side note: I was planning on using my spice grinder here, but after adding everything to it, it wouldn’t turn on–so I did end up grinding the spices by hand! Once the whole spices are ground we add ground nutmeg and coarse ground kosher salt to the rest of the spices. Next we prepare the galangal and lemongrass. 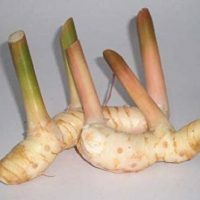 Galangal, often referred to as Thai ginger, may be related to the ginger root, but has it’s own unique flavor. If you can find it, then definitely use it in this recipe! If not, do substitute ginger and still make this recipe. It may stray slightly from the traditional flavors, but will still be delicious and there is enough going on in the recipe that it won’t be immediately obvious. Lemongrass has to be one of the most beautiful smelling foods there is. It’s a fibrous, stalky plant with a strong and fresh citrus scent. To prepare lemongrass cut off the tough base, and then about 4 inches up cut off the reedy stalks. Peel off a couple of the tough outer layers and underneath you’ve got lemongrass gold. Thinly slice the tender (which is a relative term when it comes to lemongrass) center. 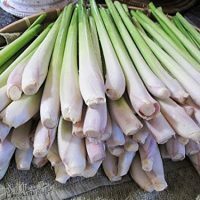 In my experience, fresh or frozen galangal is easily found at Thai and some other Asian specialty grocery stores, but unlikely to be found at your regular or natural foods grocery store. Lemongrass on the other hand, I’ve been finding fresh at Whole Foods, but otherwise can also be found at your local asian market. Minced galangal/ginger and lemongrass get dry roasted to lightly cook and char them before adding them to the food processor with the rest of the ingredients. Once everything is dry roasted and prepared, we blend them together to create the curry paste. 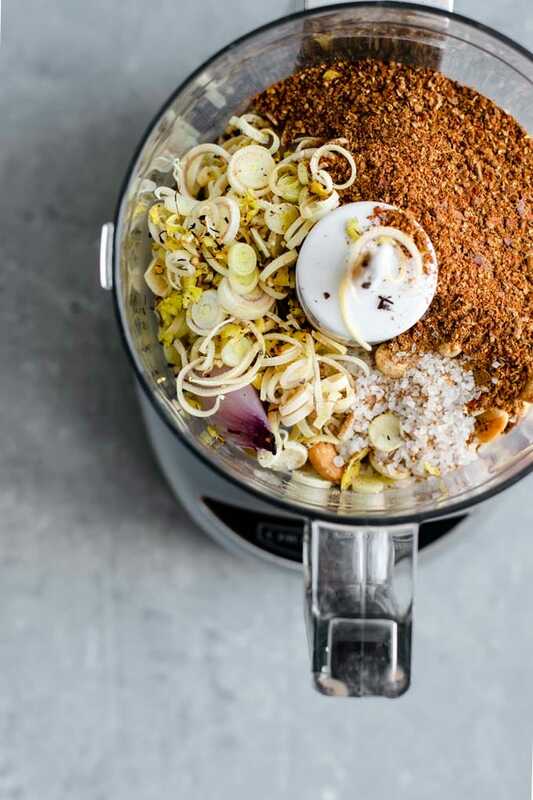 Add the ground spices (including the nutmeg and salt), peeled garlic and shallots, lemongrass and galangal, and lastly dry roasted peanuts to a food processor or blender. It doesn’t make a huge amount so use whichever one can handle smaller volumes. Blend or process to make a paste. Add a bit of water (up to 1/4 cup) to help move things along. 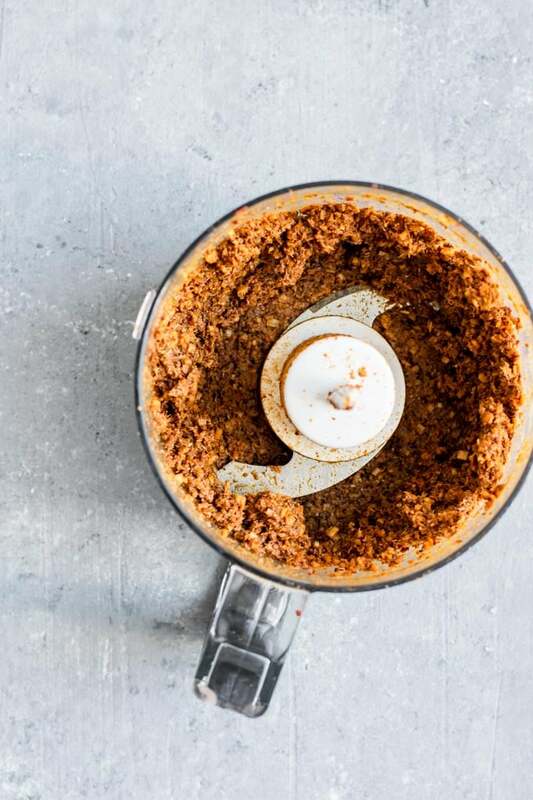 A food processor will make a thicker paste, while your blender might be able to get it smoother than shown here. You can also finish the paste up in a mortar and pestle, pounding the paste to make it smoother and even more flavorful. The grinding action of the pestle breaks apart the fibers in the paste and releases more of the aromatics. Your paste can be stored in the fridge for a few days, or longer in the freezer. This makes enough paste for 2 recipes of my Massaman curry, and you can always double the curry paste recipe to keep extra on hand. You’ll find that most recipes for Thai curry pastes include fish sauce, or sometimes shrimp paste. 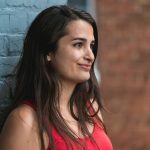 I personally don’t find any flavor missing from my curry pastes by simply leaving them out, but you can always add a tablespoon of vegan fish sauce to this recipe if you’d like. If you make this massaman curry paste, leave a comment below and rate the recipe on the recipe card. And please share your photos with me on Instagram, tag @thecuriouschickpea and #thecuriouschickpea. I love seeing your recreations! 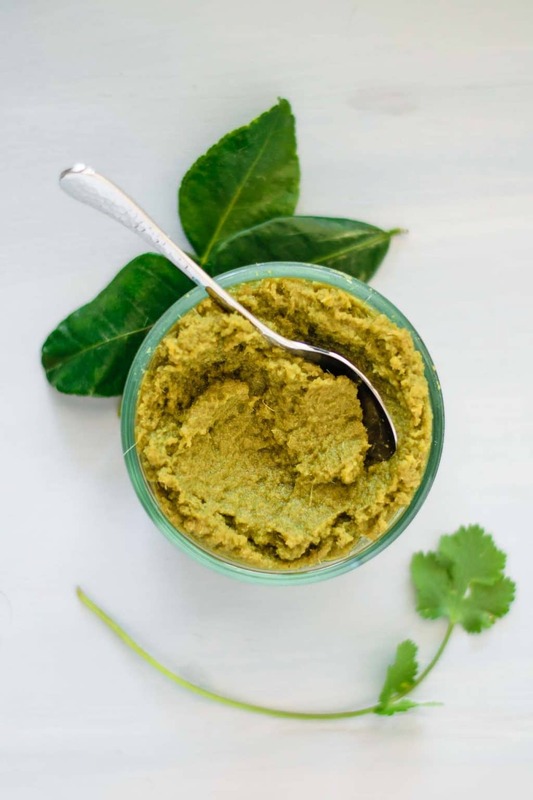 If you enjoy Thai curries, also try my green curry paste!